Francis R. Bradley. Forging Islamic Power and Place: The Legacy of Shaykh Daud bin ‘Abd Allah al-Fatani in Mecca and Southeast Asia. University of Hawai'I Press, 2015. 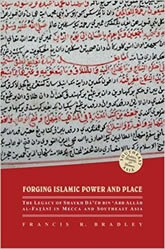 Forging Islamic Power and Place charts the nineteenth-century rise of a vast network of Islamic scholars stretching across Southeast Asia and the Indian Ocean to Arabia. Following the political and military collapse of the tiny Sultanate of Patani in what is now southern Thailand and northern Malaysia, a displaced community of scholars led by Shaykh Dā’ūd bin ‘Abd Allāh al-Faṭānī regrouped in Mecca. In the years that followed, al-Faṭānī composed more than forty works that came to form the basis for a new, text-based type of Islamic practice. Via a network of scholars, students, and scribes, al-Faṭānī’s writings made their way back to Southeast Asia, becoming the core texts of emerging pondok (Islamic schools) throughout the region. Islamic scholars thus came to be the primary power brokers in the construction of a new moral community, setting forth an intellectual wave that spurred cultural identity, literacy, and a religious practice that grew ever more central to daily life. In Forging Islamic Power and Place, Francis R. Bradley analyzes the important role of this vibrant Patani knowledge network in the formation of Islamic institutions of learning in Southeast Asia. He makes use of an impressive range of sources, including official colonial documents, traveler accounts, missionary writings, and above all a trove of handwritten manuscripts in Malay and Arabic, what remains of one of the most fertile zones of knowledge production anywhere in the Islamic world at the time. Writing against prevailing notions of Southeast Asia as the passive recipient of the Islamic traditions of the Middle East, Bradley shows how a politically marginalized community engineered its own cultural renaissance via the moral virility of the Islamic scholarly tradition and the power of the written word. He highlights how, in an age of rising colonial power, these knowledge producers moved largely unnoticed and unhindered between Southeast Asia and the Middle East carrying out sweeping cultural and religious change. His focus on Thailand’s so-called “deep south,” which has been marginalized in scholarly studies until recent times, helps lay the groundwork for a new generation of scholarship on the region and furthers our understanding of the present-day crisis in southern Thailand. The study of Islam in Southeast Asia has been most often relegated to the realm of religious studies, and historians have considered the development of the nation as the single-most important historiographical problem in the region. By focusing on the role of human agency and the logistics of knowledge transmission, this book transforms our understanding of the long and complex history of the flow of religious knowledge between the Middle East and Southeast Asia.